Anmerkungen Battlezone gilt als der erste First-Person-Shooter. Combat-ready for high profit scoring. Battlezone is a totally new one player, first person combat game. Players compete for the highest scores in a world beyond the stars. 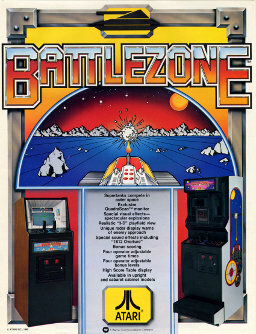 It's a battle of skill and wits between the player and the computer-controlled enemy tanks and missiles. Players start with 2, 3, 4 or 5 (operator adjustable) tanks. By moving the controls the player can maneuver his tank in a 360° radius. A quick glance at the "radar scan" display shows the location of enemy tanks… "Enemy in range" appears on the screen… the player positions his tank, aims, presses the fire button and the enemy tank is blown away!